Hilton Head Distillery Grand Opening! [vc_row][vc_column][vc_row_inner][vc_column_inner][vc_column_text]If you were fortunate enough to attend Hilton Head Distillery’s grand opening celebration on September 23 and 24, your head is probably still spinning from all of the fun that you had (and maybe partly from the many samples you enjoyed). We had a blast welcoming Hilton Head to our growing family; it was a weekend full of memories we won’t soon forget. Food Trucks – What goes perfectly with craft spirits? Food! Guests enjoyed wonderful, fresh food from Shrimp Loco Tacos & Salad and Tavino’s Wood Fired Oven and delectable desserts from Hilton Head Ice Cream. Free Gifts – The first 50 guests to arrive on Friday received a free gift, and prizes were also awarded every hour. Each guest who purchased a tour and tasting package received a free entry into the raffle. They gave away so many prizes it seemed like everyone walked away with something! Special Promotions – On Saturday, everyone who bought two bottles from the distillery received a free rum cake. If you’ve never tried rum cake, trust us… you are missing out! A Pin in the Map – Event goers who purchased a bottle of spirits were encouraged to place a pin on a large world map to show where they came from. At the end of the weekend, the map was full of pins, proving just how far people will travel for fine spirits! Great Music – There were some special friends onsite to provide foot-stomping mood music for the Grand Opening event. The crew at BOB 106.9 played everyone’s favorite country tunes during the day and afterwards, Whitley Deputy & The B-Town Project took to the stage to dazzle us with their awesome blend of funk and soul. Special Guests – In addition to talented musicians and DJs, we also met with our friends from Dark Corner Distillery and Cayman Spirits Company. A group of gentlemen very near and dear to our hearts were also there – Tim Triplett, Tim Grovenburg, Peter Thompson, and Joe Fenten. These guys are a huge part of the success of the Brass Ring Spirit Brands operation. Distillery Tours – We were thrilled to see so many people take advantage of Hilton Head’s tour and tasting experience! For just $15, guests got to go behind the scenes and see how their unique spirits are made. As if that weren’t enough, they also received a full tasting flight! Two Words: Espresso Rum – In honor of the special Grand Opening event, Hilton Head Distillery crafted a special batch of Espresso Rum for guests to sample. Specialty spirits are clearly their passion, and this one complemented the festivities perfectly. [/vc_column_text][/vc_column_inner][/vc_row_inner][/vc_column][/vc_row][vc_row][vc_column][vc_column_text]Even though the party is over, the fun has just begun. 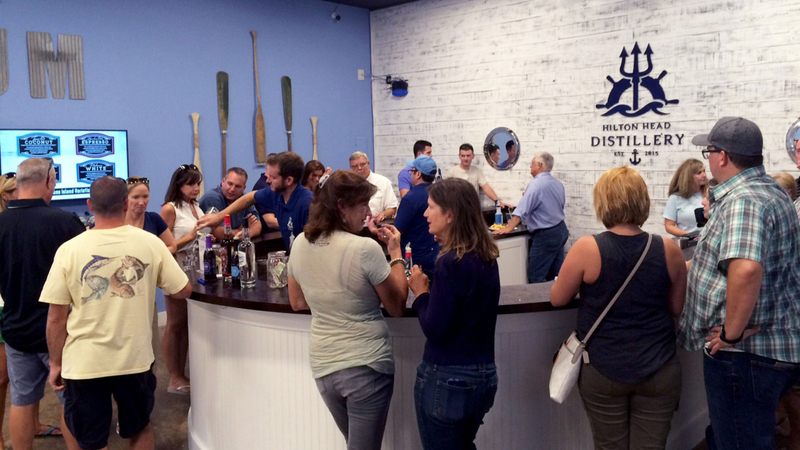 The opening of Hilton Head Distillery is great news for rum and vodka lovers. The next time you find yourself on Hilton Head Island, stop into the distillery for a tour and a tasting flight of their one-of-a-kind spirits.